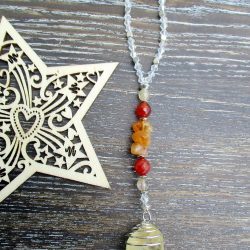 These lovely crystal charms can hang from your rear vision mirror in your car, hang in your window, and they also make the perfect Christmas tree charm – a lovely present for those people that are hard to buy for! These can be made to order by emailing Kirsty with your crystal preferences – most of the crystal sets combinations can be made into your own special charm. 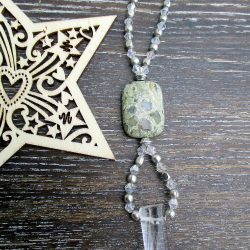 They include Crystals and also Swarovski crystals and Zinc Alloy beads – they are finished with a toggle clasp so you can place it around most tree branches.